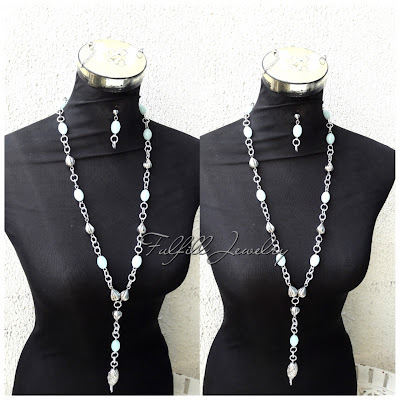 Fulfill Jewelry Blog: Stones and Beads: Any Difference? Stones and Beads: Any Difference? "Are they stones or beads?" I have decided to clarify certain things which many people mix up and don't really know much about. Even those in the jewelry world here are not excluded. I would start with "stone". This is a short form or an abbreviation for "gemstone". Gemstones (also known as precious or semi-precious stones) are minerals found in various forms cut and polished, used to make jewelries.Most gemstones are hard, rare and expensive. These are cut into different shapes and sizes for jewelrymaking. They are also graded based on their colours, shapes, sizes which in turn affects the price. Examples are pearls, diamond, corals, ruby etc. On the other hand, beads are small pieces of glasses, stones or similar materials used to make jewelries or sewn on clothes.However,these beads can come also in gemstones. This means they can be cheap (if they are plastics, certain crystals or glass) or expensive(gemstones or high end crystals like swarovski). For instance, crystals come in different grades(qualities) with the best quality being swarovski crystals. Next to that is the czech crystals followed closely by chinese crystals. The higher the quality, the longer the shine, colour beauty and sparkle! So beads and beaded jewelries can be passed from generation to generation if they are stones or high end crystals! When next you come across beads and beaded jewelries, you are better informed on their differences and quality.You are also now more aware on what you are bargaining or hoping to buy.